Researched and contributed by Eric North. The Story of an Epoch-Making Trip by a Motor Car – Driven Around the Globe in Relay by Buick Dealers – With Every Foot of Land en Route Covered by Buick World-Wide Service. Transportation has played a most vital part in the history of man, and every phase of its development is of tremendous interest and importance. Of all the forms of present-day transportation, the motor car is the most personal. By its means one can go anywhere, at any time, without restriction of a time-table. Proper service facilities have made the automobile as reliable as the railway train, while having far more flexibility of schedule and riding comfort. Demonstrating that the time has arrived when the motor car owner can confidently travel anywhere, even around the world, a Buick touring car has recently completely encircled the globe, unaccompanied by either a fixed driver or mechanic, the car being driven the entire distance by Buick distributors and dealers in relay. It is on December 20, 1924, that the trip officially starts. On that date, the “Around-the-World” Buick, in its export box is swung aboard the s.s. Aurania in New York, bound for Liverpool. From that point on, the future of the intrepid car depends solely upon its sturdy mechanism and the Buick sales and service organisation. Landing at the port of Liverpool, the world traveller becomes temporarily the charge of the local Buick dealer, and under his guidance sets out immediately for London. Between tidy English fields and hedges it speeds, through Litchfield – hesitating a moment at Stratford-on-Avon to pay its respects to William Shakespeare-through Warwick, Swindon, Nottingham, and into the fog and grime of London. A quick panorama of historic England, and then the boat for Amsterdam. Over rough brick highways, across the flat lowlands of Holland to Haarlem, The Hague, and Rotterdam flies the Buick. Along the road, in the cities, people are enthusiastic. Crowds collect-questions are asked. “Hurrah, around the world!” shouts another urchin, who has climbed up on the spare tyres on the rear and who, with his profane hob-nailed shoes, gives the car the first souvenir of its long trip around the world. Southward, toward the Belgian border, and the car crosses small rivers and canals, their banks lined with willows drooping in the chill winter air. Into Belgium, and through busy industrial towns. The schedule is not elastic, and the Belgian Buick distributor wastes no time in touring. Straight to Paris he drives, where the adventurous car again changes hands. Through the crowded streets of Paris, then south again, past Fontainebleau and castled towns reminiscent of the days of monarchical and imperial France. Toward Lyons, where the ubiquitous vineyards give way to mulberry trees, a heavy fog impedes progress not at all. Through Avignon on roads over which Napoleon thundered in his swaying coach, and the Buick reaches Marseilles, 875 kilometers from Paris, in 15 hours. Almost a record! Boarding ship at Marseilles, the car has a few days of salt air on the Mediterranean before taking to the road again. Then the busy clangor or Port Said, the gateway of the East, where the bustle and rush of commerce never cease. Then Cairo, the indescribable. Here East and West meet as nowhere else on earth. 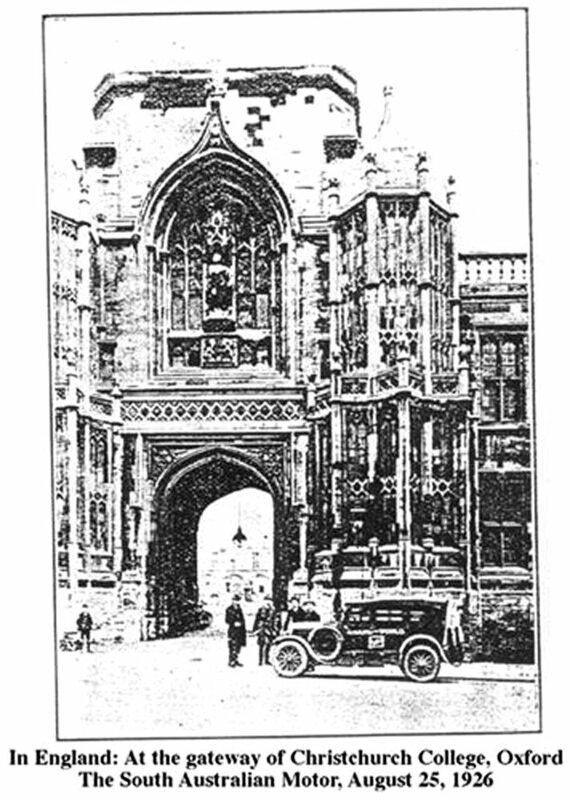 Reeking bazaars within a stone’s throw of magnificent buildings and broad streets. An ever-flowing tide of changing, restless people – a strange mingling of the Orient with Western civilisation. Crossing the Nile, the Buick, like any world tourist, visits the Sphinx and the Great Pyramid at Gaza. Then back, eastward again, across the Isthmus of Suez and into Palestine. At Gaza, on February 4, 1925, the distributer for Syria takes charge of the Buick, and the most colorful part of the trip commences. From Gaza the way leads to Jerusalem, the Holy City, with its teeming, odorous streets. Ancient brick-walled houses that witnessed the birth of Christianity stare uncomprehendingly at the irreverent piece of steel and human ingenuity that dares to stir up the dust about them. Undaunted, the car continues, coming before long to Nazareth – a mere village in the time of Christ, now covering the bowl-shaped valley in which it is built to the tops of the surrounding hills. From Nazareth across the bleak hills to Haifa – a white city perched on the nose of recumbent Mount Carmel. Then Beirut. Beirut welcomes the Buick as an old friend. 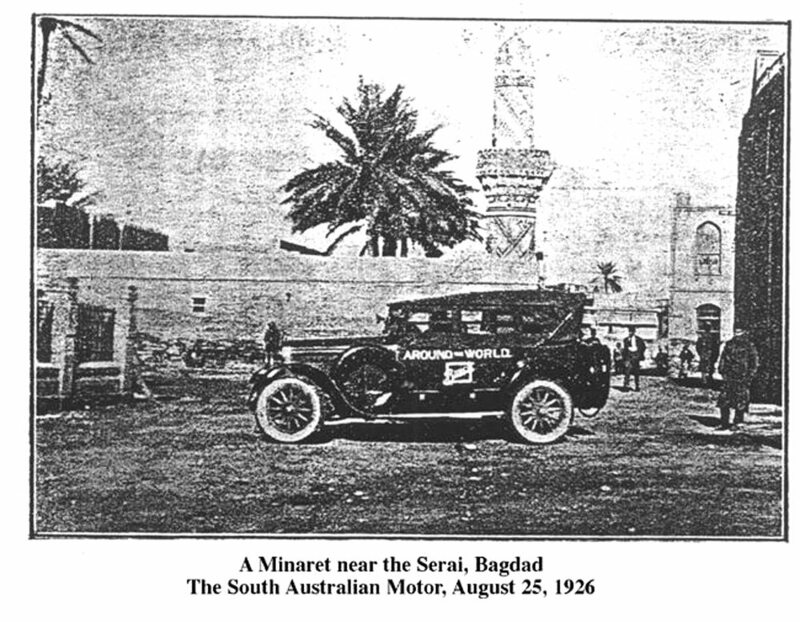 The desert route from Beirut to Bagdad was opened for the first time, a few years ago, by a Buick, and Buick cars are running regularly as part of the passenger and mail service operated by the Nairn Transport Company over the 600 miles of the Syrian Desert. For political and geographical reasons, the desert crossing is not safe for a single car, and the “Around-the-World” Buick joins one of the Nairn convoys for the trans-desert trip. East from Beirut, for miles, the road ascends sharply over the Lebanon Mountains, elbowing its way through narrow gorges. Few corners of the globe offer more utter solitude than Syria and Palestine. Soon in the distance Damascus “Pearl of the Desert”, gleams in the sun on its green oasis. Straight east the car flies, maintaining a speed of 65 miles an hour over that flat floor of the desert, across the Tigris and Euphrates by primitive bridges of boats, and into the labyrinthian bazaars of the “City of Caliphs”, Bagdad. The road now leads to Basra, on the Persian Gulf. All goes well until just after leaving Kut, the town where Townshend?s army was penned in by the Turks early in the Great War. Here the Buick breaks through an ancient culvert, and the pulling cable and bridging boards are brought into action. There is some delay but no damage, and soon the car is on its way again. But before long, new difficulties present themselves. For the next 70 miles the road is intersected by irrigation ditches at frequent intervals – ditches six feet deep and from fifteen to twenty feet broad, the majority of them unbridged. It now becomes a matter of crawling down and crawling out again, and making the best of it. 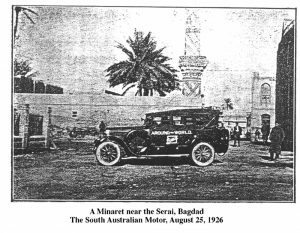 Four-wheel brakes prove, as usual, a blessing, and largely as a result of accelerating and decelerating efficiency, the Buick arrives in Basra a little in advance of schedule time. Then by steamer down the shallow Persian Gulf to Bombay, lying in the curve of the shore and backed by its straight hills. All roads in India lead to Bombay, and in its busy streets can be seen all types and nationalities. The Bombay distributor encounters little of incident on the road from Bombay to Agra, aside from one mishap, when the Buick has to be pulled out of the ever-present Indian mud by bullocks, in trying to board a native ferry boat. The speedometer now reads 3,828 miles. Agra, and the Taj Mahal, set among palms and spacious lawns, and mirrored in its often-pictured waterway. Dazzling whiteness of masonry against the rich, radiantly tropical sky. Here the Calcutta distributor takes the driver’s seat. 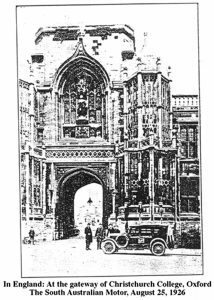 Then the open road again to Delhi – the inscrutable heart of India – and the Buick enters the great “city within a city” through the magnificent Lahore Gate, towering high above the entrance to the fort. The car’s splendid appearance excites comment everywhere, as the damp climate of India works particular havoc with the average automobile paint work. “When was it last painted?” inquire casual bystanders, marveling at the lustre of the Duco finish. From Dehli through Cawnpore – city of sad memories – and the stately grandeur of Lucknow the car speeds. On to Calcutta, by the Ganges delta, where the symbols of Western civilisation stand side by side with the throughly Oriental. From Calcutta to Colombo, Ceylon, by steamer, and another distributor takes the wheel of the indefatigable Buick. Seven thousand feet through the verdant tropical vegetation of Ceylon the car climbs, past tea estates and cinnamon fields and occasionally a rambling village of bamboo houses. The weather changes suddenly, and the return journey is made through pouring rains and over flooded roads. Then Colombo again – highways flanked by thick forests of towering palm trees. 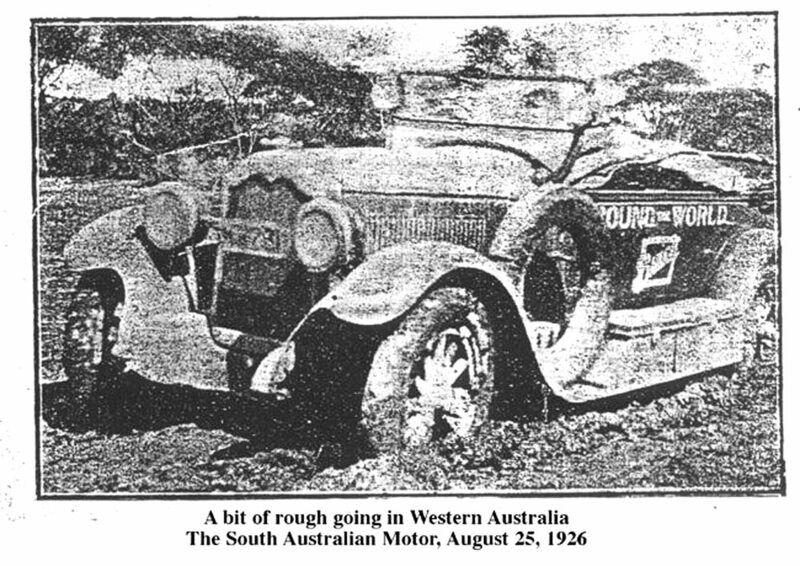 Before leaving by steamer for Fremantle, the landing port of Perth, Australia, the Buick’s average petrol consumption in Ceylon is worked out at 25.2 miles to the gallon. From Perth to Adelaide, across the trackless transcontinental wastes of Australia, is an arduous journey at best. It represents, in this case, the supreme test, and means the success or failure of the whole trip. Leaving Perth, the car follows the dreary reaches of the Goldfields as far as Coolgardie – the centre of the gold rush in ‘92 – then branches off for the mining town of Norseman, 480 miles from Fremantle and the coast. As settlements and roads are left behind, troubles commence. For the first 30 miles the track is exceedingly rough and stoney, after which, without warning, comes a mile of heavy sand, followed by a stretch of boggy ground in the zone of a recent thunderstorm. In a little while down goes the Buick to the running boards. Out comes spades, and the car is laboriously dug loose. Then, with infinite patience, a corduroy road is built of small trees and branches. For 160 miles these intolerable conditions persist, the car sinking in 15 or more times. But the worst of the ordeal is over. The character of the country changes as the South Australia border is passed, and for 135 miles the car travels the Nullabor Plains, where the saltbush and bluebush are the only forms of vegetation, and where the going is at least level. The beautiful city of Adelaide at last, after eight days on constant strain, during which the car has travelled 1,826 miles. It is weather-stained and muddy, but still running as smoothly as ever. 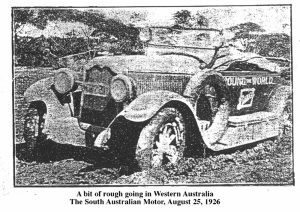 Leaving Adelaide on Easter Sunday, April 13, the Buick speeds to Melbourne, and thence to Sydney, in New South Wales, over the southern road which, almost impassable in places, is famous for its stretches of sand, mud and loose stones. From Sydney to Auckland by boat, and the Buick faces the mountains and gorgeous scenery of New Zealand. 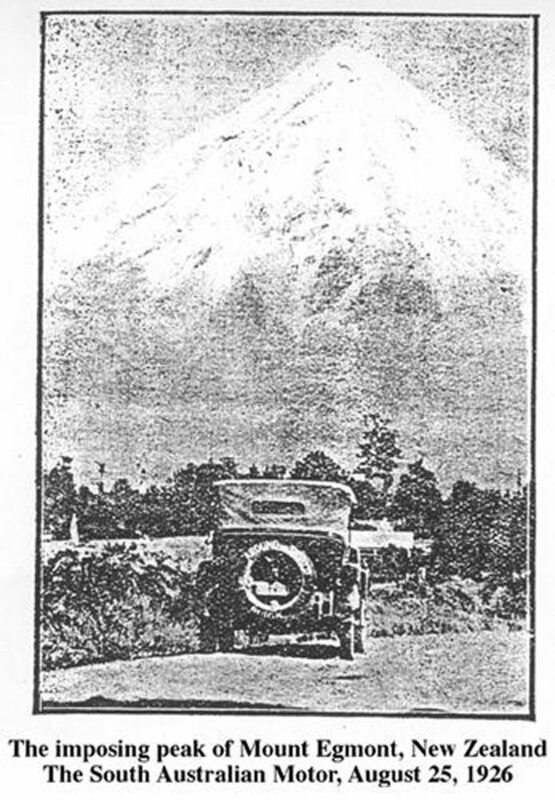 From Auckland, spread out over its seven hills, the car tours through Rotorua, which besides being the centre of the thermal spring region is the heart of the Maori territory, through Gisborne and Napier to Wellington, seat of the New Zealand Government, whence it is shipped to Christchurch, in the South Island. Christchurch is the centre of Canterbury Plain, a great sheep-raising territory, stretching 150 miles from north to south. 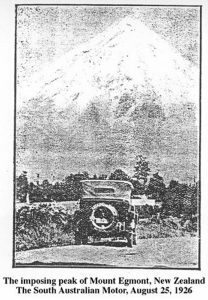 Here the car skirts the coast, passing through the prosperous seaside towns of Ashburton, Timaru, and Oamaru, arriving in due course at Dunedin, the centre of trade and port of the district of Otago. This was originally a Scotch settlement, and Dunedin City is planned, and the streets named, after Edinburgh..
Then to Invercargill, the southernmost town in New Zealand, and incidentally the point farthest south reached by the Buick on its world tour. The return journey, from Invercargill to Dunedin, is perhaps the most delightful part of the whole trip. The Buick performs to perfection, even taking the fearsome Kilmog Hill without difficulty. Up one, two, three miles, with never a falter. There was no need to change gears; silkily and without effort the car reaches the top, then coasts down to Waitati. Mount Cargill is the next climb, reached toward nightfall. The Buick slips easily over the top and Port Chalmers glitters below, while far away, at the end of the bay, the myriad lights of Dunedin twinkle a welcome. From Dunedin the itinerary leads back to Auckland, and the car is shipped to Honolulu, Hawaii, after covering a total of 2,281 miles in New Zealand. Tropical Hawaii accords the world traveller an enthusiastic reception. Then the boat for San Francisco, and the Buick, relayed from dealer to dealer, starts from the Pacific coast across the United States. At Flint, Michigan, its birthplace, the Buick receives a royal welcome from the 16,000 members of the Buick family at the factory. Speeding on to Detroit, the car crosses over into Canada, coming back into the United States at Niagara Falls. The last lap of the “Around-the-World” Buick tour is completed in New York on June 23, when the car is driven through the streets to City Hall, where the Mayor of New York adds the final signature to the “log”, which has been signed by various officials and drivers throughout the entire trip. When the car reaches New York, it has been handles by 94 different drivers. The speedometer reads 16,499 miles. From New York to New York, completely around the world, and the Buick has accomplished its aim. Another milestone has been reached in the records of pioneer automotive achievement. Before the trip started, the whole itinerary was timed. Steamers were booked far in advance to transport the car between countries separated by water. Distributors were informed as to just when they should receive the car, and to whom and when they would deliver it. The successful completion of the trip attests both to the faultless performance of the car itself, and to the efficient manner in which it was handled in the many different countries. The “Around-the-World” Buick tour is a true demonstration of the extent to which the Buick car, and the Buick organisation, can be relied upon by Buick owners, wherever they may be or go. It is a great satisfaction for each of the 900,000 Buick owners to know that “the sun never sets on Buick Service”.